With only two weeks left in the NA LCS, every game matters and the standings are never stable. Here are the Week 8 Power Rankings. 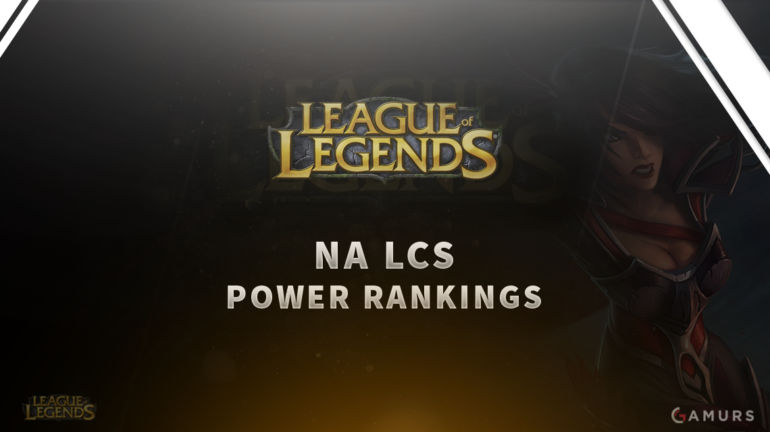 The seventh week of the North American League Championship Series (NA LCS) has come to a close, and with it comes an updated edition of GAMURS’s power rankings. Now, without ado, here are the power rankings for the eighth week of the NA LCS. Do these guys ever lose? I mean seriously. Yet another perfect 4-0 week leaves TSM at the top. No surprise there. This quest for perfection is one of the most impressive runs in League of Legends history. Currently sitting at a 14-0 series count with a 28-3 game count, TSM looks unstoppable. What’s even better? We’re entering the eighth week of play, but TSM has not even dropped a game since dropping the opener of the Echo Fox series in week four. That is 16 straight game wins. The gods of North America do not lose. TSM looks impressive, but we should remember just how good this Immortals squad is. Another 2-0 weeks sees the squad unanimously at the No. 2 spot once again. TSM may be the undefeated team, but Immortals only have one loss. This rematch Week 9 is looking better and better as the weeks go on. It is abundantly clear that the NA LCS is top-heavy, with TSM and Immortals being much stronger than the rest of their competition. No team in the league can beat TSM, unless Immortals can pull it off, and no team besides TSM can beat Immortals. A 1-1 week from Liquid was not exactly what the team wanted, but it certainly was not a surprise either. Last week was Liquid’s chance to break rankings across the world and beat TSM… That did not happen. After starting the week with an easy 2-0 over Phoenix1, Liquid ended the week by getting decimated against TSM by the same score. It was not very close, reinforcing the idea that the NA LCS is extremely top-heavy. This week, Liquid faces a resurgent Counter Logic Gaming squad looking to prove that they can still be top North American team. Last week, we really saw how far CLG has come since its awful start to the split. Falling 2-1 to Immortals and defeating Cloud9 by the same score, CLG moves up yet another spot in our rankings. The most impressive thing about CLG is the team’s ability to persevere and continue to get better. Always the underdog, CLG shines the most when it is underestimated by everyone else. Well, they are back. This week they look to reclaim a top three spot and reassert themselves as one of the best teams in North America. Last week was not a very good one for Cloud9, as they went 1-1 and did not look impressive. Facing off against Apex Gaming should have been an easy 2-0, given how strong Cloud9 has appeared to be and how poorly Apex has been performing as of late, but the series was close and only ended 2-1 in Cloud9’s favor. What made this team lose its spot at No. 4 in our rankings, though, is the loss to CLG. Certainly, 2-1 is not a bad loss, but this split was supposed to be different. Cloud9 was supposed to be the better team. However, CLG’s recent improvement proved too much for Cloud9 to overcome. Going into this week, Smoothie is being given the starting job full-time at support as Michael “Bunny FuFuu” Kurylo has been moved to the bench, with rumors of a possible move to Immortals circulating. EnVyUs may not have moved down in our rankings, but that is simply because the bottom of the NA LCS is looking pretty weak all around right now. Another 1-1 week was far from impressive. NRG eSports, a team that has been struggling heavily to get wins lately (even falling last week to Phoenix1) defeated EnVyUs 2-0. Sure, EnVyUs bounced back and took Apex down 2-1, but that is not something to brag about. EnVyUs performed poorly in both of their series last week yet again, and I can only wonder if they have what it takes to bounce back this week and take on the likes of Cloud9 and TSM. Well, it was not a fluke or a prank. Phoenix1 won another game and they are still No. 7 in our rankings. Despite NRG’s surprise win over EnVyUs, this squad has not looked good and sits at No. 8 in our rankings. Beating EnVyUs 2-0 was certainly a shock, especially considering the fact that early last week, NRG was defeated 2-1 by Phoenix1. The entire split, this squad has been inconsistent across the board and they still were last week. Playing through GBM made NRG look a lot better than they have at any point this split, so this squad needs to keep that up if they want to survive the inevitable promotion tournament. Going 0-2 last week hurt Apex, a lot. Both losses may have only been 2-1, but they were both still losses. It is very hard to judge the bottom of the NA LCS right now, and I know I sound like a broken record by saying that again. Three weeks ago, Phoenix1 beat Apex. Two weeks ago, Apex beat NRG. Last week, NRG beat EnVyUs and Phoenix1 beat NRG. It is just a cluster of madness, but right now Apex looks like one of the weaker squads in the group. TSM and Immortals were unanimously voted No. 1 and 2 in our rankings, and Echo Fox was unanimously voted No. 10 after another 0-2 week. The worst team in the league by all accounts right now, Echo Fox had a rough time last week facing off against the top two teams in the league. It was total decimation on all accounts as TSM and Immortals swept Echo Fox with ease. This squad is just not in a good spot and they do not have time to improve. The lowest seed going into the promotion tournament is likely what this team is looking at, meaning a relegation match against Team Liquid Academy. Right now, TLA looks like the stronger team. Spencer Hester is an editor for GAMURS can be contacted by email at Hester.esports@gmail.com or on Twitter – @SpenceGAMURS.